/ Who’s Using my Netflix Account to Watch Movies? If you’ve ever shared your Netflix account credentials with a sick friend or family member, it is quite possible that it was shared further or that they’re still using your account to enjoy the wide range of Netflix movies and series. Which can affect you in a number of ways beyond just messing up your recommendations. Actually, I always find that the Netflix recommendations are pretty awful anyway, and if you don’t have different account profiles for different family members too, it’s going to be hopelessly muddled. Netflix offers a couple of ways you can check to see who is using your account and from what devices, but before we get there, the most obvious action is to change your Netflix password, and as part of that, log everyone and every device out. You’ll have to log in to your account on your TV, tablet, computer and phone again, but then you’ll have a much higher degree of confidence that third parties aren’t accessing your account. First off, note the last entry: “Sign out of all devices“. That’s an easy way to close any inadvertently open doors to your account, but again, I suggest you change your password first. 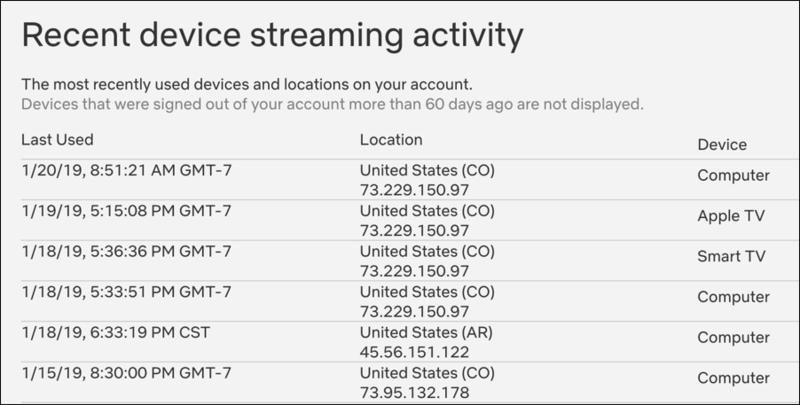 This is a bit less useful than it could be because of how Netflix displays IP geolocation, but it should be enough for you to see whether you’re having your account accessed from out of state. For me, notice the fifth entry is from a device located in Arkansas. Weird, I haven’t visited there in the last few months, so that’s a bit suspicious. Then again, I use VPNs quite a bit so my computer might have been hooked up to a VPN in that state when I accessed Netflix. Note: Netflix recognizes VPNs to ensure that people don’t masquerade as being in the EU, China or the USA when they’re actually based elsewhere. If you do try to use a Virtual Private Network, be prepared for it to fail. FYI. 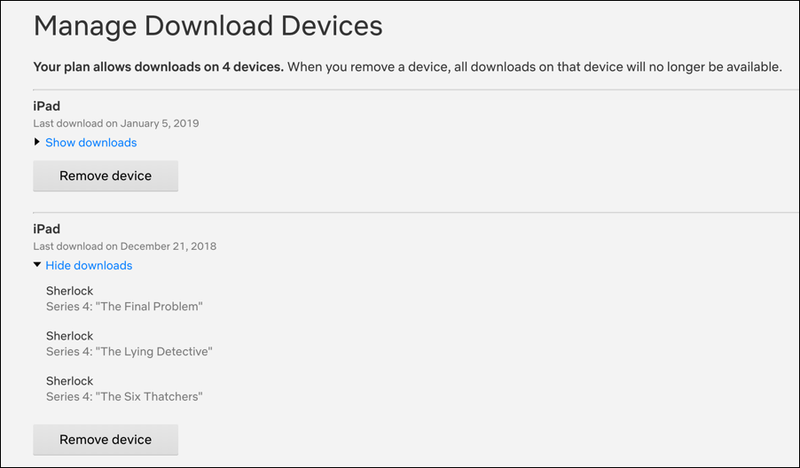 As you can see above, we have two tablets that are downloading content from this particular Netflix account, one of which is episodes of the great BBC series Sherlock. No problems there! That’s my viewing activity, alright. Not a really heavy Netflix user myself, but those are the films and series I either watched or at least started to watch before I bailed (IO, for example). See things that you don’t remember? Again, it might be a good time to change your password and log out all devices. 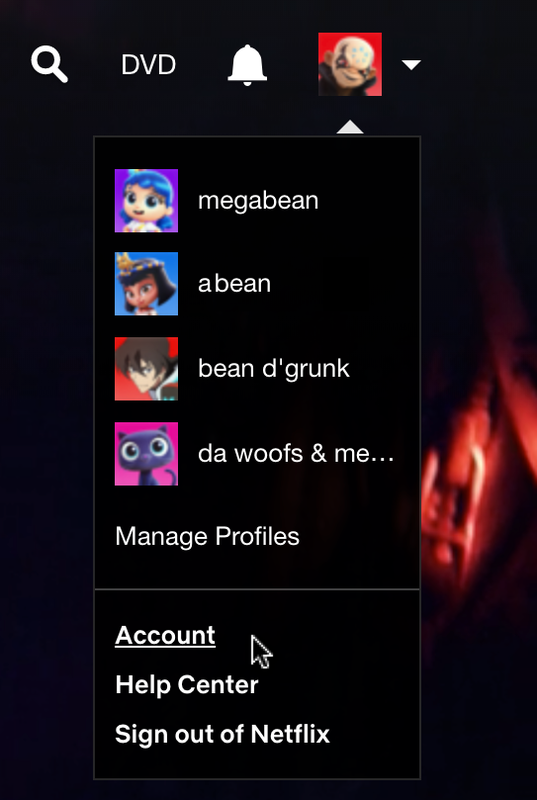 Finally, note that the Account info like Viewing activity is per profile on your Netflix account so if you want to see what one of the other profiles has been viewing, you’ll need to switch to that profile, go to Settings, then check “Viewing activity” again. So that’s it. Hopefully you’ll check and find nothing odd at all, but if you do find curious data, you also now know what to do! Pro Tip: I have a lot of Netflix and computer usage tips on the site. Please spend a few minutes checking it all out!